Pediatric Dentistry. When and How? Oral hygiene: Oral hygiene measures should be implemented no later than the time of the eruption of the first primary tooth. Cleansing the infant’s teeth as soon as they erupt with either a washcloth or soft toothbrush will help reduce bacterial colonization. ​Children’s teeth should be brushed twice daily with fluoridated toothpaste and a soft, age-appropriate sized toothbrush. 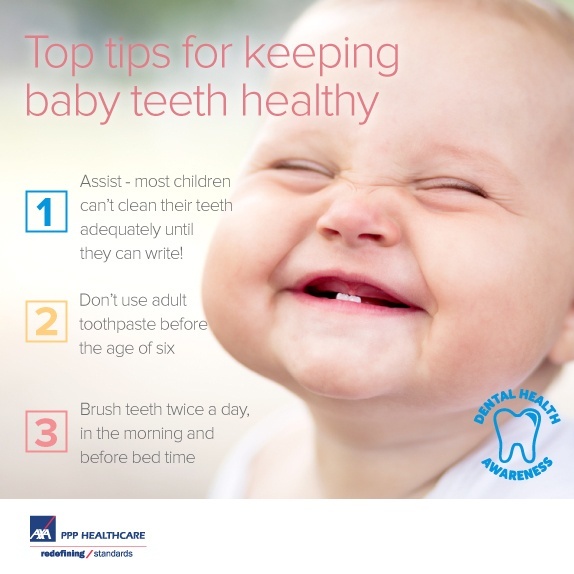 A “smear” of toothpaste is recommended for children less than 2 years of age, while a “pea-size” amount of paste is recommendedfor children 2-5 years of age. ​Flossing should be initiated when adjacent tooth surfaces cannot be cleansed with a toothbrush. Diet: High-risk dietary practices appear to be established early, probably by 12 months of age, and are maintained throughout early childhood. Frequent night time bottle feeding, ad libitum breast-feeding, and extended and repeated use of a sippy or no-spill cup are associated with, but not consistently implicated in ECC. Likewise, frequent consumption of snacks or drinks containing fermentable carbohydrates (e.g., juice, milk, formula, soda) also can increase the child’s caries risk. 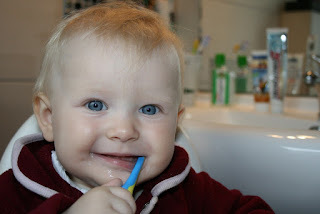 Fluoride: Optimal exposure to fluoride is important to all dentate infants and children. The use of fluoride for the prevention and control of caries is documented to be both safe and effective. Twice-daily brushing ​and Professionally-applied fluoride, as well as at home fluoride treatments, should be considered ​a dental routine ​for children​. Systemically-administered fluoride should be considered for all children drinking fluoride deficient water (<0.6 ppm).Caution is indicated in the use of all fluoride-containing products. Fluorosis has been associated with cumulative fluoride intake during enamel development, with the severity dependent on the dose, duration, and timing of intake. Decisions concerning the administration of additional fluoride are based on the unique needs of each patient. Injury prevention: Practitioners should provide age appropriate injury prevention counseling for orofacial trauma. Initially, discussions would include play objects, pacifiers, car seats, and electric cords. Non-nutritive habits: Non-nutritive oral habits (e.g., digit or pacifier sucking, bruxism, abnormal tongue thrust) may apply forces to teeth and dentoalveolar structures. It is important to discuss the need for early sucking and the need to wean infants from these habits before malocclusion or skeletal dysplasia’s occur. Behaviour management in dental clinic Safe and effective treatment of dental diseases often requires modifying the child’s behavior. Behavior guidance is a continuum of interaction involving the dentist and dental team, the patient, and the parent directed toward communication and education. Its goal is to ease fear and anxiety while promoting an understanding of the need for good oral health and the process by which that is achieved. For treating children a variety of behavior guidance approaches are used it is important to, assess accurately the child’s developmental level, dental attitudes, and temperament and to predict the child’s reaction to treatment. The child who presents with oral/dental pathology and noncompliance makes the management more challenging. The pediatric dental staff can play an important role in behavior guidance. Communication may be accomplished by a number of means but, in the dental setting, it is affected primarily through dialogue, tone of voice, facial expression, and body language. One should communicate with the child patient briefly at the beginning of a dental appointment to establish rapport and trust. Various behavior management techniques such as Tell-show-do is used by many pediatric professionals. The technique involves verbal explanations of procedures in phrases appropriate to the developmental level of the patient (tell); demonstrations for the patient of the visual, auditory, olfactory, and tactile aspects of the procedure in a carefully defined, nonthreatening setting (show); and then, without deviating from the explanation and demonstration, completion of the procedure (do). The tell-show-do technique is used with communication skills (verbal and nonverbal) and positive reinforcement. Voice control is a controlled alteration of voice volume, tone, or pace to influence and direct the patient’s behavior. ​Distraction is another technique involving diverting the patient’s attention from what may be perceived as an unpleasant procedure. Giving the patient a short break during a stressful procedure can be an effective use of distraction prior to considering more advanced behavior guidance techniques. Some children may require a more advanced behavior management techniques using pharmacological agents such as conscious sedation, deep sedation or general anesthesia. Nitrous oxide/oxygen inhalation is a safe and effective technique of giving conscious sedation to reduce anxiety and enhance effective communication. Its onset of action is rapid, the effects easily are titrated and reversible, and recovery is rapid and complete. Additionally, nitrous oxide/oxygen inhalation mediates a variable degree of analgesia, amnesia, and gag reflex reduction. Some children and developmentally disabled patients require general anesthesia to receive comprehensive dental care in a safe and humane fashion. 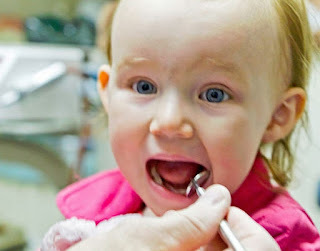 Many pediatric dentists (and others who treat children) have sought to provide for the administration of general anesthesia by properly-trained individuals in their offices or other facilities (eg, outpatient care clinics) outside of the traditional hospital setting. Preventing dental caries Pit and fissure sealants has been described as a material placed into the pits and fissures of caries-susceptible teeth that micromechanically bonds to the tooth preventing access by cariogenic bacteria to their source of nutrients. Fluoride application Systemically-administered fluoride supplements Fluoride supplements should be considered for all children drinking fluoride-deficient (<0.6 ppm) water. After determining the fluoride level of the water supply or supplies (either through contacting public health officials or water analysis), evaluating other dietary sources of fluoride, and assessing the child’s caries risk, the daily fluoride supplement dosage can be determined using the Dietary Fluoride Supplementation Schedule. Professionally-applied topical fluoride treatment Professional topical fluoride treatments should be based on caries-risk assessment. A pumice prophylaxis is not an essential prerequisite to this treatment. Appropriate precautionary measures should be taken to prevent swallowing of any professionallyapplied topical fluoride. Children at moderate caries risk should receive a professional fluoride treatment at least every 6 months; those with high caries risk should receive greater frequency of professional fluoride applications (ie, every 3-6 months). Ideally, this would occur as part of a comprehensive preventive program in a dental home. Fluoride-containing products for home use Therapeutic use of fluoride for children should focus on regimens that maximize topical contact, preferably in lower-dose, higher-frequency approaches. Fluoridated toothpaste should be used twice daily as a primary preventive procedure. Twice daily use has benefits greater than once daily brushing. Additional at-home topical fluoride regimens utilizing increased concentrations of fluoride should be considered for children at high risk for caries.These may include overthe-counter or prescription strength formulations. Fluoride mouth rinses or brush-on gels may be incorporated into a caries-prevention program for a school-aged child at high risk.